Yul Kwon, the first Asian American to win Survivor (who used his notoriety from his victory to champion Asian American causes in the media), announced by email today that he recently joined the FCC as Deputy Chief of the Consumer and Governmental Affairs Bureau. Washington, DC — Today, Federal Communications Commission Chairman Julius Genachowski announced the appointment of Mindel De La Torre as Chief of the International Bureau and Yul Kwon as Deputy Chief of the Consumer and Governmental Affairs Bureau. Chief, International Bureau, Mindel De La Torre. Since 1998, Ms. De La Torre has been the president of the consulting firm Telecommunications Management Group, Inc. (TMG). Prior to joining TMG, Ms. De La Torre was the deputy chief of the Telecommunications Division at the International Bureau, which she joined in December 1994. Ms. De La Torre also worked at the Department of Commerce — for over four years at the National Telecommunications and Information Administration (NTIA) and for three years in the General Counsel’s office. She has been a member of various U.S. delegations to International Telecommunication Union conferences, such as World Radiocommunication Conferences, World Telecommunication Development Conferences, and Plenipotentiary Conferences. Ms. De La Torre has a B.A. from Vanderbilt University and a J.D. from the University of Texas. Having lived overseas most of her life, she speaks fluent Portuguese, French, and Spanish, and is proficient in Italian. Deputy Chief, Consumer and Governmental Affairs Bureau, Yul Kwon. Mr. Kwon’s diverse career spans across law, technology, business, and media. His government experience includes lecturing at the FBI Academy, drafting science and technology legislation as an aide to Senator Joseph Lieberman, and clerking for Judge Barrington D. Parker on the 2nd Circuit Court of Appeals. In the business and technology sector, Mr. Kwon has held positions at McKinsey & Company, Google, and the Trium Group. He also practiced law as an attorney at Harris, Wiltshire & Grannis and at Venture Law Group. In 2006, Mr. Kwon became the first Asian American to win the CBS reality show, Survivor. His subsequent media activities include working as a special correspondent for CNN and as a co-host for the Discovery Channel. Mr. Kwon obtained his B.S. degree in Symbolic Systems from Stanford University and his J.D. from Yale Law School, where he served on the editorial board of the Yale Law Journal. It’s good to see Yul getting back into public service! He has been an amazing advocate for the Asian American community, and I always appreciate his intelligent and insightful perspectives on Asian Americans and the media. Yul was also a big proponent of improving Asian American voter outreach and political participation during the ’08 election, a commitment which was of tremendous importance during that (and any) election. If my archives hadn’t been deleted, I’d include a link to my interview with Yul here. Stupid blog restart. In his email announcing his new position, Yul muses on the irony of joining the FCC, which has, at times “imposed fines for the kind of wardrobe malfunctions that seem to be an ever-present risk on the TV show that propelled [him] to public recognition in the first place.” Could this be a not-so-veiled reference to Yul’s own apparent love/hate relationship with clothing on his season of Survivor? The image included in this post is one of the few I could find on Google Image of Yul where he’s got a shirt on: most of the other ones on the Internet would be enough to make any FCC Deputy Chief blush. Shirtlessness aside: congratulations, Yul! I’m sure your thoughtful perspectives and history of great advocacy work will ensure incredible success at the FCC! Yesterday was a very big day for America’s Asian American and Pacific Islander community. In conjunction with a Diwali celebration, President Obama signed an executive order that reestablished an advisory committee and a White House iniative on Asian American and Pacific Islanders. The advisory committee was first established by President Clinton ten years ago, but was eliminated by President Bush in favour of a committee housed under the Department of Commerce that focused primarily on economic issues within the APIA community, ignoring other issues like healthcare, language and education. What I really loved about the speech that President Obama gave was that it discussed the issues facing the Asian American community in language that really suggested familiarity with ongoing concerns. President Obama referenced the “model minority myth” and talked about high prevalence of specific diseases. These are problems that the APIA community has been dealing with for years, and I feel as if for the first time in a long time, they are finally receiving the national attention that our people merit. Our AAPI communities have roots that span the globe, but they embody a rich diversity, and a story of striving and success that are uniquely American. But focusing on all of these achievements doesn’t tell the whole story, and that’s part of why we’re here. It’s tempting, given the strengths of the Asian American and Pacific Islander communities, for us to buy into the myth of the “model minority,” and to overlook the very real challenges that certain Asian American and Pacific Islander communities are facing: from health disparities like higher rates of diabetes and Hepatitis B; to educational disparities that still exist in some communities — high dropout rates, low college enrollment rates; to economic disparities — higher rates of poverty in some communities, and barriers to employment and workplace advancement in others. Some Asian American and Pacific Islanders, particularly new Americans and refugees, still face language barriers. Others have been victims of unthinkable hate crimes, particularly in the months after September 11th — crimes driven by ignorance and prejudice that are an affront to everything that this nation stands for. And then there are the disparities that we don’t even know about because our data collection methods still aren’t up to par. Too often, Asian American and Pacific Islanders are all lumped into one category, so we don’t have accurate numbers reflecting the challenges of each individual community. Smaller communities in particular can get lost, their needs and concerns buried in a spreadsheet. In particular, I was delighted to hear President Obama talk about the lack of adequate studies that specifically delve into the problems of the APIA community. Above all issues, I think our community suffers from a general lack of good, high-quality data; we simply don’t know the scope and the depth of the problems we face as a racial/ethnic population. Too often, we still rely on anecdotes and stories; it’s hard to lobby for change when we can’t adequately convince others that there is a problem with concrete facts, figures and numbers. solicit public input from AAPI communities on ways to increase and improve opportunities for public participation in Federal programs considering a number of factors, including language barriers. If even just some of these goals are met by the time the effects of this Executive Order expire, two years from now, than our community will be incredibly well-served. I look forward to seeing what comes from the events set in motion by yesterday. Hopefully by this time next year, we might even have a federally-funded study looking at specific disparities faced by members of the Asian American community! I applaud President Obama’s intiative in helping the APIA community. As he promised on the campaign trail, as president Barack Obama would return attention to the nation’s must under-served, and most-deserving, people. As Barack Obama said in his speech yesterday, no community should be invisible to their government; yesterday, the president took steps to bring the issues of our community out of the shadows. WASHINGTON– Today, President Barack Obama signed an Executive Order reestablishing the White House Initiative on Asian Americans and Pacific Islanders, an executive order established a decade ago by President Bill Clinton to improve the quality of life in underserved AAPI communities through increased participation in federal programs. The White House Initiative will be housed under the Department of Education to be co-chaired by Secretary of Education Arnie Duncan and Secretary of Commerce Gary Locke, and by a yet-to-be-named Executive Director. The Initiative will consist of a federal inter-agency working group comprised of staff from various agencies, which will be overseen by a Commission comprised of AAPI leaders and experts in various sectors. The Commission’s role is to advise the President, through the Secretaries of Education and Commerce, on executive branch efforts to improve the quality of life of AAPIs through the compilation of research and data related to AAPI populations and sub-populations; development, monitoring, and coordination of Federal efforts to improve the economic and community development of AAPI businesses; implement strategies to increase public and private-sector collaboration; and foster community involvement in improving the health, education, environment, and well-being of AAPIs. Since the implementation of affirmative action in the college admissions process, opponents of the policy have alleged anti-White and anti-Asian bias that reduces the chances of White and Asian high school students applying to elite colleges. Recently, a study conducted by Princeton sociologist Thomas Espenshade (published in the book No Longer Separate, Not Yet Equal: Race and Class in Elite College Admission and Campus Life) presented data that appear to support this notion. First of all, I should point out that the primary data Espenshade analyzed were collected in 1997. But, it’s likely that the trends that Espenshade report remain in effect, since there have been no major changes to the college admissions process nationwide since then, nor have we seen significant changes in student demographics. The “Scary Graph”: what does it mean? 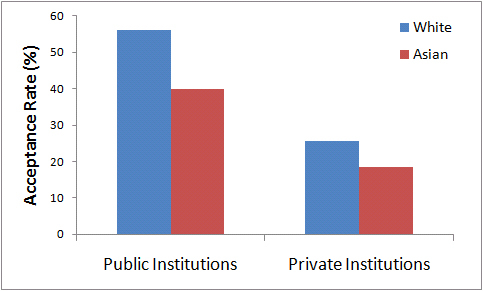 Espenshade shows that middle class Asian students have a reduced probability of being accepted into private universities compared to students of other races (I re-created the graph below from page 7 of this presentation of Espenshade’s data, eliminating upper- and lower- class students, but the trends are roughly the same). What this graph is showing you is that while Asian Americans are roughly 4% of the U.S. population, we represent nearly a quarter of all applicants to the institutions studied by Espenshade. For some universities, this can reach as high as 1/3 — and many of these applicants boast high SAT scores and high school GPAs. Many of these students also come from higher-income families compared to Black and Latino applicants, and therefore have access to better educational opportunities to help improve their scores. In addition, Espenshade’s data show that, compared to other races, Asian American applicants appear to preferentially apply to private institutions, which causes an even more dramatic increase in our applicant number. Basically, the admissions percentage is low for Asians is at least in part because so many college applicants are Asian/Asian American. You can think of it this way: if 50 White students, 25 Asian students and 5 Black students are accepted to a college, but there are 100 White applicants, 75 Asian applicants and 10 Black applicants, your probability of being accepted based on race is as follows: 50% for Whites and Blacks, and only 33% for Asians — even if the absolute number of acceptances are still higher. And certainly, we must remember that Espenshade’s study does not consider non-numerical aspects of applicant portfolios; admissions boards often favour applicants who have acceptable scores but who have also demonstrated a diversity of talents or interests, including music, athleticism, or art. But what can’t be denied from Espenshade’s data is this: if you’re an Asian American high school student, you are competing against a lot of other, highly-talented White, Black and Asian American applicants and you have a lower probability of being accepted based on race compared to applicants of other races. But does this mean there’s “anti-Asian bias”? I caution against coming to the conclusion that Asian Americans are patently discriminated against in the college admissions process. Instead, I think what we’re seeing is the flip side of affirmative action: affirmative action argues that, all other factors being equal, an applicant who is a member of an underrepresented minority (whether race-based or class-based) will be preferred over a similar candidate who is not of an underrepresented minority. Clearly, college admissions board aren’t outright refusing Asian American applicants based solely on race. In fact, even with affirmative action in place, Asian Americans are four times better represented at elite universities compared to our national population. What this also means, however, is that because Asian Americans are so well represented in higher education, there is no racial “preference” for Asian/Asian American applicants based solely on race (Espenshade’s data shows high probability of acceptance for lower-class Asian Americans, which hints that less well-represented Asian ethnicities who also tend to come from lower-income families are still beneficiaries of affirmative action). Thus, we cannot compare the probability of acceptance rates for Asian Americans against those of underrepresented minorities; with affirmative action in place, those probabilities will — by definition –be higher for Black, Latino and Native American applicants. It’s not that we’re being biased against in affirmative action practices, it’s simply that we’re not benefiting from affirmative action — nor should well-represented Asian ethnicities be beneficiaries of affirmative action. Nonetheless, this kind of comparison is tempting, because it is fueled by the entitlement complex that those who are not underrepresented minorities tend to feel. An Asian American applicant, who scores highly on his or her SAT test expects to be accepted, but, when they do not get in compared to a Black or Hispanic Non-White applicant who does, they feel as if life’s unfair. How often have applicants to college (or law school, or medical school) complained that “less qualified” minorities are skating through the admissions process on the back of affirmative action policies? The bottom line is that underrepresented minorities are not skating through the admissions process. Universities will only accept applicants that meet a certain minimum standard for GPA and SAT — so no student, be they Black, White or Asian, accepted into college is actually unqualified. 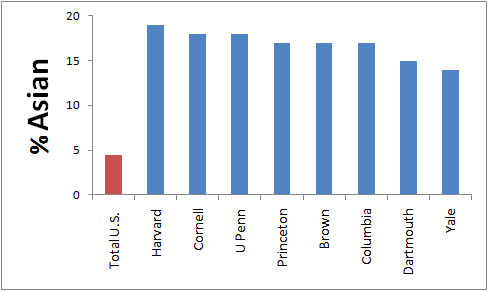 Moreover, the characterization of lower-scoring applicants who are accepted into college based, in part, on affirmative action relies on the assumption that SAT scores directly correlate with success in college life: yet, studies on the effectiveness by which SAT scores predict college success remain conflicted on whether the SATs are truly a good indicator that an applicant is “qualified” for college life. In addition, critics of the standardized tests argue that the SAT and other tests are culturally biased, and that higher-class applicants fare better in part because they can pay for test-taking prep classes that help them achieve a higher score. In other words, someone who scores a perfect score on the SATs may not actually be “better qualified” than another applicant who scores lower. Moreover, scoring highly on the SATs does not guarantee acceptance into top schools; schools nowadays emphasize breadth as well as depth, and seek out applicants who do well academically while pursuing diverse, non-academic interests. 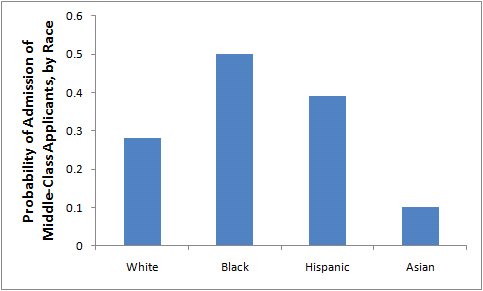 Because of unequal opportunities that unfairly disadvantage Black and Non-White Hispanic students in college admissions, affirmative action seeks to improve representation of these minorities in each incoming student body, by preferentially choosing the underrepresented minority student when compared to a student of similar standing who is not underrepresented. As far as I can tell, this is one of the few ways affirmative action is put into practice, based on the ruling by the Supreme Court that found explicit racial quotas unconstitutional. Thus, because neither Whites nor Asians are underrepresented on the campuses of elite universities (and thus don’t benefit from affirmative action), comparing acceptance rates for Asians against beneficiaries of affirmative action is an erroneous comparison specifically designed to whip up anti-affirmative action sentiment. It ignores the fact that Asian Americans remain, even with affirmative action, well-represented on college campuses. It uses “Scary Graphs” (like the first one in this post) to raise hysteria and resentment between Asian/Asian Americans and other racial minorities, ignoring the fact that with affirmative action in place, we know those acceptance rates will not be the same. Instead, to determine if there is any “anti-Asian bias” in the admissions process, we should really be comparing the acceptance rates of Asian/Asian Americans against the other “non-beneficiary” group: Whites. These data are striking. 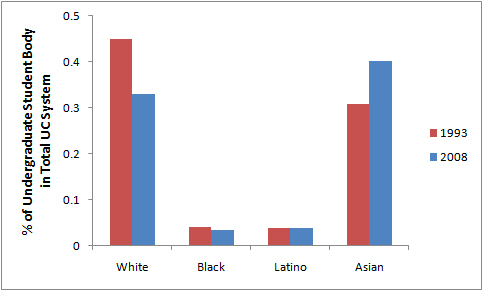 Neither Whites nor Asians benefit from affirmative action, and Whites and Asians share similar class distributions. Yet, Asian applicants are roughly 10% less likely to be accepted to private colleges, and nearly 15% less likely to be accepted to public institutions, compared to their White counterparts. 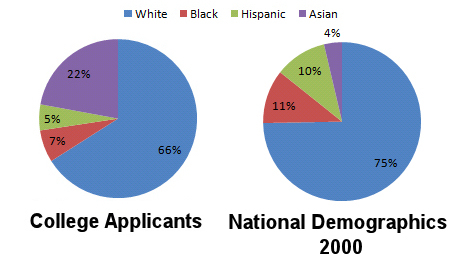 The decreased acceptance rate holds true despite the fact that Asians are far less likely than applicants of other races to apply to public institutions — yet, unlike with the Black and Latino populations where reduced applicant rates explains, at least in part, high acceptance rates, the same is not true for Asian/Asian American applicants. By all rights, since neither White nor Asian applicants benefit from affirmative action, our acceptance rates should be about the same. Asian applicants, on the whole, have poor “breadth” qualifications that reduce the quality of their applications, e.g. music, art, a second language, etc. Asian applicants tend to be first and second generation, whereas White and Black applicants tend to be third, fourth or higher generation Americans (see Table 3.6 on page 7), making Asian applicants less likely to benefit from high acceptance rates for legacy students (Table 3.1 on page 2). Asian applicants are more likely to be international, and do not benefit from higher “in-state” or “domestic” acceptance rates. There is a currently unaddressed anti-Asian bias in the admissions process. Most of these possibilities are not addressed (or debunked) by Espenshade’s study. Thus, at this time, it’s possible to conclude that there is anti-Asian bias in the admissions process, but it’s not the kind of anti-Asian bias that has been used to launch attacks against affirmative action. Instead, Espenshade’s data suggests that there Asian/Asian American applicants might face unequal treatment, compared to White applicants, when applying for institutions of higher education. Perhaps this manifests as admissions boards wanting to limit the size of their Asian American student population and therefore specifically choosing White applicants over similarly-qualified Asian applicants. Alternatively, perhaps we’re seeing a manifestation of an internalized (and institutionalized) model minority myth which makes it more difficult for Asian applicants to demonstrate “breadth” qualifications (that are nonetheless present in the application) because we are being perceived by the admissions review board as math, science or engineering nerds. Regardless, the possibility that Espenshade’s data are uncovering evidence of anti-Asian bias in the admissions process to public and private colleges warrants further study. Studies like Espenshade’s have been used by right-wing conservatives to attack affirmative action. And certainly, Espenshade’s data show that acceptance rates are not the same between under-represented and well-represented racial groups. But the question remains: should those rates be equal? Proponents of ending affirmative action argue that each applicant, regardless of race or class, should have the same acceptance rate as any other applicant. And this might make sense — if applications could really be equally judged across race and class. However, as I’ve mentioned, debate rages on as to whether so-called “standardized” tests are truly standardized, or if they suffer from cultural bias. Without a federalized public high school system, the meaning behind high school GPAs also vary from district to district, and from state to state. In other words, getting straight A’s in one school might not get you straight A’s in another. In addition, being from an upper-class background affords opportunities that lower-class applicants don’t have access to. Applicants from wealthy families can afford to enroll in expensive prep schools that specifically train students to get into college — even if they aren’t necessarily smarter than the poor kids who can’t afford private school tuitions. In addition, wealthy applicants can afford to pay the expensive application fees such that they can apply to multiple schools; poor students are limited to applying to schools with low application fees or to a fewer number of schools, reducing their chances of admittance. Affirmative action is intended to address the disparities and unequal opportunities for applicants, and to make admission to higher education more accessible for disadvantaged applicants. But, more importantly, affirmative action policies exist to make a more diverse student body. Consider this: in the state of California, where affirmative action practices have been out-lawed, the racial demographics in state colleges and universities have only become less representative of national demographics. Comparing students by race/ethnicity in the total UC system in 1993 against the same data collected in 2008 (Table 7k), we see that Asian American students now make up more than 40% of all undergraduate students, while the percentage of White, Black and Latino students decreased over that time period. Not only are underrepresented minority groups languishing without affirmative action in place in the California school system, but students of well-represented racial/ethnic groups are also suffering due to these disproportionate student populations. Anti-affirmative action fundamentalists and fervent Asian American nationalists might applaud that nearly half of UC students are Asian American, but I propose that this actually diminishes the quality of education that our Asian American students have access to. Academia is about developing a forum of discussion, argument and debate; where a free-flowing exchange of ideas can take place. This can only occur in a diverse populace where students are exposed to unique ideas originating from a multiplicity of different perspectives and backgrounds. When nearly half of all people that a student can meet in class come from a similar background, the student loses the opportunity to have his or her worldview challenge. Without that kind of an education, one must question how prepared these college students are to face a racially, ethnically, and economically diverse reality upon graduation. Perhaps more so than any other institution, colleges and universities need affirmative action in order to survive. Getting into college isn’t easy; and it’s not supposed to be. We have to recognize that no one can — or should be allowed to — skate into college, and that the same difficulties and frustrations you feel with the admissions process of your favourite undergraduate institution are felt by high school students across the country, regardless of race, class or gender. When you get in, you feel on top of the world; but if you don’t, often you feel like the process was unfair and biased. The argument against affirmative action in colleges is too-often made by groups who feel entitled to higher education, and who can’t abide by the fact that they should have to work for it (and to prove themselves) just like everyone else. And the classic “anti-Asian bias” argument that touts facts and figures comparing acceptance rates for Asian/Asian Americans against those of minority groups underrepresented in higher education only pits minority groups against one another while propping Asian Americans as the token “model minority”. Rather than to blindly accept a charged, politically-motivated, and misleading interpretation of college admissions data (often collected in good faith by well-meaning scientists like Espenshade), it’s important to consider studies like those presented above carefully. I think there is evidence here that Asian Americans experience anti-Asian bias in the college admissions process. Nothing to date addresses the unequal acceptance rates between White and Asian students, despite a lack of difference in treatment by affirmative action policies, and despite similar application rates. More studies must be done to figure out what’s behind those disparate admissions probabilities. But does that mean that Asian Americans aren’t benefiting from higher education? Hardly. Around the country, Asian Americans are better represented on college campuses than we are in the national population. And while some Asian ethnicities remain underrepresented, on the whole, our community is churning out well-educated degree-holders who are entering the skilled workforce en masse. So, if you’re an Asian American high school student applying to college, remember the following: the admissions process will be difficult, but with decent grades and SAT scores, and with diverse interests in music, drama or another language, you’ll find a great college. Ask for help in preparing your application — clearly, there are lots of Asian Americans out there who have been through this process. And, above all, don’t limit yourself to the elite schools that are receiving tons of Asian American applicants: make sure to apply to a few less well-known or public schools, even just as a back-up. Because here’s the final piece of advice I have, and it’s one that some people don’t want to vocalize: In the end, it’s not about what school you get into (or how you get in, whether by affirmative action, legacy, athletic scholarships, or if you speak six languages and are a world-renowned kazoo player) — it’s about how well you succeed once you get there. The rest of it’s just getting your foot in the door. What happens after that is up to you. It’s not too often that I get to attend an Asian American-related event in Tucson. Yesterday, I got the opportunity to watch a screening of the documentary Patsy Mink: Ahead of the Majority and attend a Q&A with filmmaker Kimberlee Bassford, afterwards. The screening was sponsored by several local feminist progresive groups, and proceeds from the event went towards funding female progressive candidates in the next election cycle. Ahead of the Majority is a thorough documentary that follows Mink’s rise through the political ranks in Hawai’i to her election as congresswoman when she lobbied to pass Title IX, and finally to the end of her life in 2002. From the documentary, I learned quite a bit about Mink’s legacy that I didn’t previously know. For example, I had no idea Mink ran for president in Oregon on an anti-Vietnam War platform in 1972. Though she only garnered 2% of the vote in the Oregon primary (her candidacy was a political anti-war statement), Mink is the first Asian-American to run for president of the United States of America. I was also struck by how often racism and sexism placed obstacles in front of Mink, and how she powered through each and every challenge without ever appearing defeated or weakened. When Hawai’i first achieved statehood in 1959, Mink and fellow politico Daniel Inouye ran for House of Representatives and Senate respectively. The documentary noted how Mink and Inouye initially hoped to both be elected and to work together in Washington D.C .to represent Hawai’i. However, Democratic party leaders in Hawai’i pressured Inouye to drop out of the Senate race a month before the election and challenge Mink for Congressman. Already a popular political figure in Hawai’i, Inouye ran essentially on the platform that voters should choose a man, not a woman, as their representative — and Mink lost the seat overwhelmingly. Mink ran again in 1965 and was finally elected to the House of Representatives, where she ultimately served 6 terms and worked tirelessly to author and pass Title IX. Mink was an outspoken advocate for women, children, and the poor, and the documentary includes many clips of Mink speaking passionately on these issues in interviews and on the floor of the House. In 1976, after serving as a Congressman for 11 years, Mink gave up her seat to run for Senate. Again, her opponent, Spark Matsunaga, launched character attacks against Mink causing her to eventually lose the race. Returning to Honolulu, Mink was elected to City Council. After failed races for Mayor and Governor of Hawai’i, Mink again ran for her House of Representatives seat in 1990, winning on a platform of experience and dedication. She won in a landslide victory, and returned to Washington where she advocated tirelessly on behalf of poor people and women until her death in 2002. Ahead of the Majority is eye-opening and well-researched; no easy task for filmmaker Kimberlee Bassford considering no full-length biography of Patsy Mink has ever been written. And it is this one simple fact that is perhaps most striking about Ahead of the Majority. After viewing this film, I couln’t help but wonder: Why is it that we remember Susan B. Anthony, Harriet Tubman, Shirley Chisholm, and feminist theorists like Gloria Steinam and Andrea Dworkin, but most people are unaware of Patsy Mink and her legacy? Why has her story been ignored for so long by biographers, filmmakers, and modern historians? As an Asian American and as a feminist, Patsy Mink is the quintessential role model. As alluded to by Ahead of the Majority‘s tagline, Mink would not be defeated by oppression and discrimination: rather, she changed the rules. The documentary notes that in the less than fifty years since the passage of Title IX, the number of higher education degrees awarded to women went from roughly 7% to almost 50%. It is amazing to realize that a woman like Mink, who did so much to forward the cause of women’s rights, was an Asian American and a feminist — her lasting legacy to the Asian American community is that we, too, can aspire to be more than society would limit us to be. We can and should be fighters for the equality that all people (regardless of gender, class, colour or creed) are deserving of. We, too, are part of America. Unfortunately, even after her death, inklings of the racism and discrimination that Mink faced during her political career remain apparent. Although Mink was a strong feminist figure, she faced endless sexism and racism throughout her life. The film opens with a clip from the Mike Douglas show, where Patsy Mink, then a sitting U.S. Congressman, is asked to dance the hula with a girl clad in a Hawai’ian grass skirt — no male sitting Congressman would be expected to do something so kitschy and degrading, both then and now. The documentary also includes a newspaper headline reporting Mink’s election to the House of Representatives; it reads: “Pert and Pretty Patsy Mink Also Has A Lot of Serious Ideas” — diminishing her status as a newly-elected member of the U.S. House of Representatives to little more than a novelty. And, time and again throughout Mink’s life, the Democratic Party of Hawai’i preferentially awarded opportunities to “haoles” despite the dedication that Asian American politicians like Mink (and Inouye) showed to the party. And while it would be nice to hope that the kind of racism and sexism that Mink faced in her lifetime had decreased, I was appalled by some of the general ignorance I witnessed during the event’s Q&A. As if unable to grasp the fact that Mink was a Japanese American woman, some in yesterday’s audience seemed unable to consider Mink anything but Japanese. With no mention made of Mink’s religion in any part of the film, audience members were convinced that Mink — based purely on her Japanese ancestry — must be a devout Buddhist (because all Japanese people are Buddhist, right?). One audience member asked Bassford whether, in her research, she uncovered evidence that Mink was Buddhist. Bassford replied, clear as day, that while Mink’s grandparents were Buddhist, Mink was not devoutly religious. However, Bassford added, Mink was likely Christian, not Buddhist. Not five minutes later, a second person raised their hand and asked whether, outside of the public burial and memorial service held for Mink after her death, there was a private, Buddhist ceremony. It was this generally awkward (mis)treatment of Mink’s racial identity that I encountered while attending the event. Event organizers touted the film entirely from a feminist perspective and only to Tucson’s feminist community, practically ignoring her place in Asian American history. Consequently, outside of myself and one or two others, there were no Asian/Asian Americans to attend yesterday’s screening of Ahead of the Majority. When Electroman questioned event organizers as to why there didn’t seem to be any representatives of Tucson’s Asian American community participating in the event, he was told that organizers didn’t know where to find politicized Asian Americans in this town. While the documentary fairly addressed Mink’s relationship with her racial identity, it felt as if event organizers weren’t sure how to honour Patsy Mink as not just a feminist figure, but as a feminist of colour. That being said, the conflict between feminism and racial activism reared its head even in Mink’s life. One audience member asked during the Q&A whether Bassford intended to make such a starry-eyed tribute to Mink’s career, or whether she had deliberately excluded criticisms of Mink. Bassford said that, in general, it was hard to find things to criticize about Mink; yet, despite my general hero worship of Mink, I think she can be fairly criticized on her lack of interest in helping to elevate other Asian Americans to elected office, or in championing Asian American issues. Unlike her colleagues, including Senator Daniel Inouye (who comes out somewhat like a villain in the documentary), Mink focused on women’s issues and poverty during her political career, and did little to encourage other Asian Americans to become more politically educated. Since Patsy Mink’s time as a Congressman, the number of women in elected positions has increased dramatically, yet there still remain only a handful of Asian Americans in higher office. As Bassford put it when I asked her about Mink’s lack of involvement in Asian American politics, she replied that while Mink is considered a role model for Asian Americans, she is not considered one of our political leaders. Bassford hits on an important point: many of the Asian American community’s political leaders are men (Councilman and current candidate for NYC comptroller John C. Liu, Senator Daniel Inouye, and Senator Daniel Akaka to name just a few). Why was it that Patsy Mink, a woman who faced so much racism in her life, and who clearly considered herself an Asian American, did not include the Asian American community as one of her political priorities? And does this abject underrepresentation of Asian American women amongst the leadership roles of our community result in a lack of attention given to Asian American feminist concerns? A woman came up to me after the event and asked me about my question regarding Patsy Mink and the Asian American community. I suggested that many feminists of colour often face sexism within their racial communities (and racism within the feminist community) that often leads to ostracization. Despite Professor Gary Okihiro’s appropriation of the phrase “when and where I enter” to describe the critical importance of eliminating sexism within the Asian American community to achieve equality for all Asian Americans, in our community as well as in other communities of colour, male leaders often emphasize an expectation that women should act in a supporting role to elevate male community leaders, rather than to seek prominence or equality themselves. Feminist issues are frequently seen as distractions from the struggle for racial equality, and too often, sexist attacks are lobbed against empowered feminists of colour from both within and outside the community when those feminists speak out against intraracial sexism. But that should not be the status quo. After watching Ahead of the Majority and witnessing the passion with which Mink challenged injustice, I wish some of her incredible energy had been used to specifically help the Asian American community. Compared to the emphasis Mink placed on sexism and women’s rights, Mink rarely spoke about the racism she encountered as an Asian American. And while Mink’s contribution towards women’s rights in this country cannot be denied, the Asian American community needs Asian American political leaders who are willing to break the silence regarding Asian American issues of all kinds, including gender issues. To that end, Patsy Mink is an amazing pioneer. She is an example to the Asian American community that we can (and should) make a difference. But Mink can certainly be criticized for the lack of attention she paid to Asian American issues, and I hope that from her life, we can remember that while Mink’s accomplishments cannot be overstated, there is much more work still left to be done. I hope that we can learn to be inclusive of feminist concerns within the Asian American community, and reduce the mistrust that seems to exist between Asian American race activists and Asian American feminists. And above all, I hope that we can take inspiration from Patsy Mink’s story to encourage more young Asian Americans to enter into politics — so that they, too, can change the rules for the better.